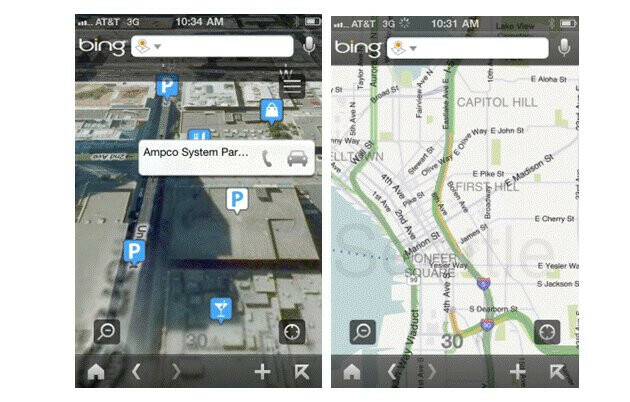 In trying to get some exposure over on the iPhone, Microsoft recently updated its Bing app for iOS which includes the latest versions of Bing Maps and Bing Travel services. When it comes to the core functions of Bing Maps, we're now presented with an updated look which does add neighborhood labels and enhancements that further provide a level a depth with it – like traffic, points of interests, and much more. In addition, there is a new Travel tab that enables users to simply look up flight information and the ability to even get the best travel deals directly in the palm of their hand. Not ending there just yet, it even will allow you to check out the status of a specific flight – so you'll know whether or not it'll be on time or delayed. Showing a considerable amount of improvement over previous editions, this latest version of the Bing app for iOS is truly beginning to shape up into a competitive and alternative offering to the host of competition out there. good, now its still crap untill it gets voice prompted turn by turn. not to mention bing search is a hot mess of bs and never finds what you want. how about you save your develpment money and just concede and let the users just have google it is superior in every way. I agree that Google has the upper hand and a superior product.. But competition is good! Without it, many of the free services we enjoy today wouldn't exist.